If you're looking for a cut-out sugar cookie recipe for your holiday baking, birthday parties, baby showers, wedding favors, you name it...you've found it. This is my all-time, go-to, never-fail, made thousands-of-'em sugar cookie recipe for decorating. And more importantly, it's yummy. Roll on a floured surface to about 1/4" to 3/8" thick, and cut into shapes. 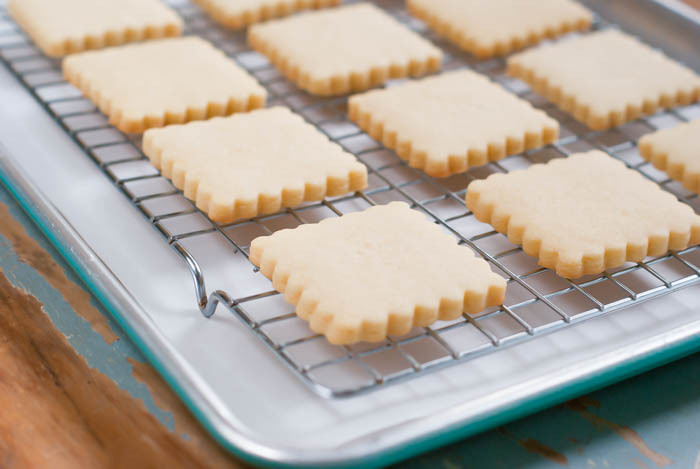 Place on parchment-lined baking sheets (I recommend freezing the cut out shapes on the baking sheet for 5 minutes before baking) and bake for 10-12 minutes. Let sit a few minutes on the sheet, then transfer to a cooling rack. More info on freezing cookies here. Decorating with kids? Gotcha covered. Need royal icing. Got that, too. Looking for gingerbread? Here ya go. Want to try some other flavors? Check out my cut-out cookie recipe index! Go forth and BAKE, my friends. This is awesome Bridget - I am ALWAYS looking for baking recipes that don't require chilling etc... to use with the boys. Filing this away in my "do-able for Les Petits Chefs in the time we have" file! Thanks - that's helpful... There *could* be holiday baking on some little boys' horizons soon! I have been using this recipe from your site for a few years. You are correct in that it is perfect!!! I get raves every time. I modify a touch by using room temp butter. The dough still rolls perfectly between two sheets of wax paper. You can tell right away if the dough is ready to roll when you can touch it and have no residue on your fingers. I use lemon and almond as flavoring. Thank you so much for this recipe. This is my "go to" sugar cookie recipe and has been for a few years thanks to you! I omit the almond extract and use vanilla bean. SO. GOOD. You're a life saver, you know that? I've been dreaming of a recipe that didn't require freezing! The style and dialog of your post made me laugh! I have always used a sugar cookie recipe from an old Betty Crocker cookbook that calls for powdered sugar and have always received compliments and raves but I think I will give yours a try. Happy Holidays! How many grams or cups is 2 sticks of butter? Two sticks of butter is one cup, 226 grams. This is the perfect cookie. Never fails me! I recommend it to everyone who asks for the recipe. Thank you! Yes! I have been looking for the perfect easy and got to recipe! These look awesome! I just baked a batch of cookies using your recipe, love them! Perfect is the right word indeed. Next will decorate them using your royal icing recipe, hope they turn out well.. :) Thanks again for the recipe! I'm just about to start my Christmas cookie baking, so I love that this recipe is here!!!! Hi! How long can the dough be refrigerated before I use it? Is it better to store it in the freezer? Thank you!! Probably a day or two. It will be VERY difficult to roll right out of the fridge. Give it at least 30 minutes at room temp. Are these cookies hard or chewy? This recipe was a God-send, literally! Saturday afternoon we were going to have a cookie baking/decorating event at our parish and someone was going to bring sugar cookie dough that she had made/chilled in advance for us to roll out and decorate. However, winter weather prevented her from traveling, so all we had were decorations and no dough...until I clicked over to your blog and saw that you had posted this recipe. Perfect!! We made it and the cookies turned out deliciously. Totally trying these ASAP!! Where did you get your square cutter? World Market! They're in a set. So cute! do you sift the flour? if so, before or after you measure it? i am new to baking and can't get the hang of this sifting thing! No sifting required. For other recipes, if the recipe calls for "2 cups of flour, sifted," measure the flour, then sift. If the recipe calls for "2 cups of sifted flour," sift some flour first, then measure. Do you have to use unbleached flour? I'm assuming either would work, but just wanted to make sure. Thanks! Thanks for sharing this Awesome tips! Can't wait to make mine now! Found this recipe via Pinterest and it worked perfectly! Thank you for sharing it. The images, the recipe are simply gorgeous and delicious. You are an inspiration, Thank you for hosting this food guides. Mouth watering images, enjoyed your article very much. Will visit your blog again. Can I double or triple this recipe? Are there any adjustments that need to be made to the ingredient amounts? 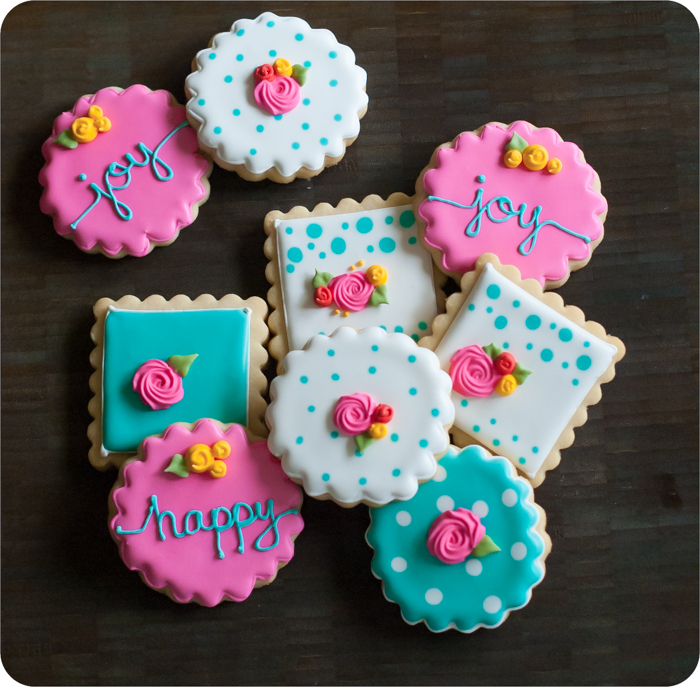 I am totally new to making decorated cookies, your blog is so informative! You mentioned that it's possible to freeze the dough before baking - do you have any tips on the best way to store it in the freezer, and then for thawing it (fridge or room temp?) before baking? Thanks so much! I've memorized this recipe because I've made it so many times! If I were out of salted butter and had to use unsalted, how much salt would I need to add? Thanks! I recommend your book to anyone that asks me about my cookies! This is my first time actually making sugar cookies! Your blog is what convinced me to give it a go! Thank You for the inspiration!!! Is there any other way that I can use this recipe without using the almond extract? Hello, I am wondering how early can I bake cookies for a cookie decorating birthday party. Since its a birthday party I have tons to do and like to finish things in advance!!! Do you know how thankful I am for this recipe?? Thank you! My daughter's birthday is this weekend and I had planned to make decorated horse cookies, but was dreading it. I've done cut outs probably ten times and each time is so stressful to get the dough rolled, cut and transferred while still cold enough to keep a nice shape. I came across your recipe this afternoon and in one hour became the proud owner of 54 horse cookies. I'm reeeeeaaaallly thankful that you posted your recipe and tips! Made these over the weekend! They are perfect. I did have to chill my dough prior to cutting just for a few minutes, though - my apartment kitchen just runs hot. I will be using these for favors, with a mongrammed fondant topper, at my upcoming bridal shower. Thanks for sharing! Oh no! I just made these and they spread out and puffed up:( It completely ruined the shapes that took a long time to do. I'm not sure why, all of my ingredients are fresh and I followed recipe perfectly. Mine spread out a lot too. Maybe chill longer? I don't know the answer. The tasted great but didn't keep their shape. Hi ladies! This is the recipe I make over and over and over again with no spreading. 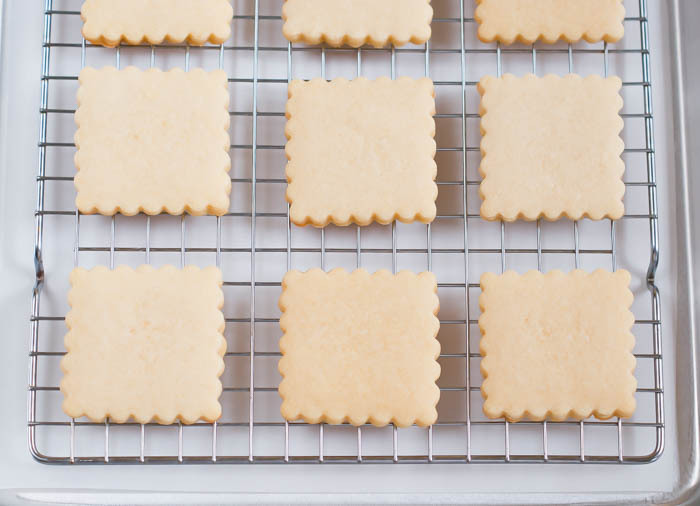 Here are a few things to make sure: butter should be cold when mixing, use pans lined with parchment or a silpat, freeze cut out shapes for 5-10 minutes before baking, make sure that cookie sheets are not warm between batches. Hope that helps. How many 2.1 x 2.7 cut out cookies does this make? Also... can I use margarine instead of butter? If so, same amount? is this 350C or 350F??????? 350C=662F. what do you think is more reasonable for cookie baking? 350f or 662 f? Great post.. thanks for sharing. I really like your blog. I just made the dough, thanks so much for the recipe. How long should I leave the dough out before rolling if I choose to refrigerate it today, and roll it out tomorrow? Just wondering because my son won't be here until tomorrow. Anyone can feel free to answer. Thanks! I tried this recipe for the first time and had some trouble. When it was mixed it was so dry and crumbly that I couldn't get it into a ball, even after I kneaded it. I put it in the fridge overnight, and the next day it was an immovable rock that even my husband had a hard time prying out of the bowl, and still too crumbly to roll out! Any ideas what I did wrong? Thanks! You may have used too much flour. You will be able to knead it together to make a cohesive dough (if you need to at the end) very easily. Yes, if you refrigerate, it will get hard. You'll have to let it sit on the counter to be soft enough to roll. I need to try your recipe, I've been looking for one but I have a huge question: Do I use baking margarine or real butter for this recipe? I think 'butter' makes a huge difference when baking food...We live in San Antonio in the city and every person I know refers to 'butter' as Country Crock, Bluebonnet, or Parkay margarine quarters. We have 'real butter' in our supermarket that rarely looks touched or noticed, I don't taste any difference but I want to make these cookies perfect. Please let me know! Thanks! We have nut allergies, can I omit the almond extract or use something in lieu of? awesome, Thank you so much for the quick reply, we are making these today! Hi, May I know the amount of sugar used in this recipe? over two weeks, and they still tasted fresh. I thank you so much for sharing this recipe! Okay, these taste amazing, but I think I might have had beginner's luck. I made my first couple batches (one batch at a time) yesterday, and they turned out PERFECT. No spreading (I froze for about 10 minutes) and nice and soft, but pretty sturdy. The ones I made today (two more batches) are definitely great in the taste department, but they've suddenly started to spread, even with the freezing. I'm using the same brand of butter, same thickness of dough, and even some of the same cutout shapes with different results. I'm certain that the kids decorating them tomorrow won't mind, but what could have changed? Earlier in the day today, I ran my oven at 500, and I pulled my oven thermometer so I'm not 100% sure on the temp accuracy--should I chock it up to that? It's the only variable I can possibly think of. I'll return to this recipe for sure, but I'm just trying to figure out what could have changed from yesterday to today. Hi Tessa! Sounds like you probably figured it out! They shouldn't spread if made as instructed. :) Happy baking! I agree with everybody above. This is my go to recipe along with the cookie flooding linked to this blog. It is my cookie recipe for life. In fact in printing it right now for the fear that one day it'll dissappear. I'm going to laminate a hard copy!!! If you freeze the cookies before decorating them, can you refreeze after? Hi Rachel! I only freeze at one step, so decide which will work better for you. Hey! I was sent this recipe by a friend and made them with my kids and their friends yesterday! 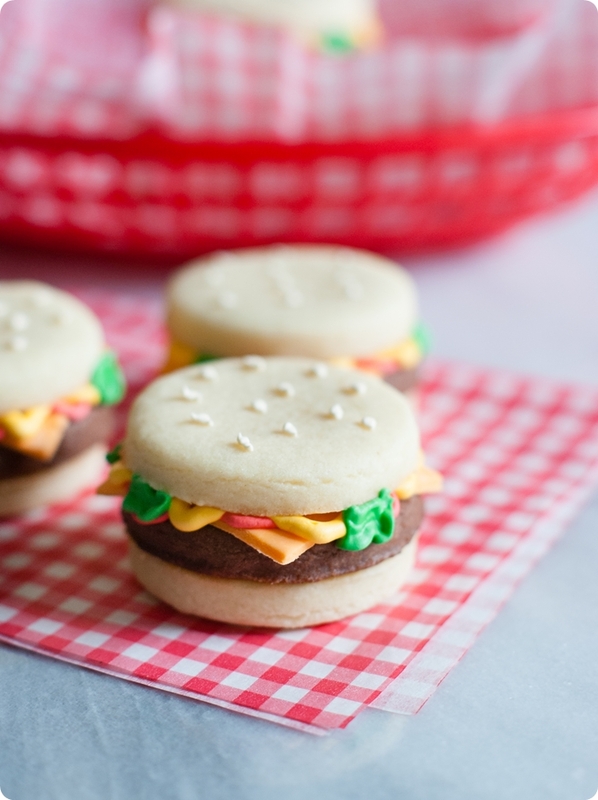 They're delicious and the PERFECT amount of sugar cookie base before adding icing. Just like your directions said, the dough was very crumbly, and I had to smush it together really well first. However, it stayed too crumbly for us to use a rolling pin, so we just kept squeezing it and then mashing it out with our fingers. I quadruple checked my ingred. amounts and I followed you right on. Help? Is it supposed to be that crumbly? You should be able to roll it out...that's the point! ;) Sounds like you might have added too much flour. Are you using the spoon and sweep method of measuring your flour? It almost sounds to me like you might have mistakenly added an extra cup. Sometimes I get off on my counting when measuring...it's easy to do. Hi, love your site. Can you use baking stevia instead of sugar? I haven't tried baking with it but I'm trying to cut down on white sugar in general. These cookies are great! They keep their shape really well, especially if you freeze them a little longer. Thanks! I'm from Brasil and I try your recipe because don't need to refrigerate, but even using the right measure the dough was very very soft (we are in summer here) and crumbly. There's something I can do to save my dough? Thank you so much and sorry the bad english. Hi Lilian! For furture batches, be sure your flour is carefully measured. Try kneading the dough together and double check measurements. Your butter should be cold or very cool to start. Thanks! Help! My cookies keep expanding! I've tried everything! My Mason jars look like balloons! Did you freeze the shapes before baking...and use cold butter? I went through the ringer with these! I've used this recipe numerous times and only one other time have I experienced the expansion. I used cold butter and froze them before baking. I had to make 9 batches so I tried a lot of different things to see if the results were different like freezing for 10 minutes, 30 minutes, using warm butter, cold butter, etc. All batches expanded. I'm at a complete loss. Any help or guidance is so appreciated! Curious if you solved this mystery. I am new to this blog and love it. I wondered if you inadvertently used baking soda instead of baking powder? I've read to remove all the leavening ingredients from these receipes. I've tried this one, sans baking powder, and they hold their shape. This recipe is GREAT. I let the butter sit out for about 15 minutes (old habits die hard!) and I also ran the egg under some warm water for about a minute. I chilled the dough in the freezer for about 5 minutes and baked them for 7 minutes at 350. My star shaped cookies came out pretty good. For the second batch, I allowed the dough to chill overnight, and then froze the cutout shapes. It came out AMAZING! I love the convenience of this recipe. Btw, Have you ever used powdered sugar instead of granulated? Can you give any insight? Im about to make about 6 dozen and not sure which route to take. The best decoration for make your home There are amazing new long term features coming up with the bathroom design software application all known to help individuals in different ways. In this age of internet and all latest gadgets the tool is proving to be a kitchen design app perfect solution that can help individuals to plan their home and accordingly give a new demission. If I freeze the shapes for a few days before baking, for how long would you recommend letting them thaw? Brigitte, have you ever made these in a food processor? how long will these keep at room temperature in a tin box? I have a vegan to make cookies for, could these be made without the egg? Which brand of flour do you use? I just made these cookies for my daughter's daycare for Hannukah. The dough is very easy to work with, I re-rolled the extra dough multiple times and it held the shape beautifully without any chilling. I really appreciate the ease of this recipe as well as the taste of the cookie. Thank you! If you are looking for the perfect cutout cookie recipe, one that stands up to decorating and tastes amazing, you've found it! I was nervous about some of the reviews, but I made two batches yesterday and decorated gorgeous snowflake cookies. It works exactly as Bridget (the author) describes, starts out crumbly and rolls out beautiful. I followed the directions exactly, rolled them thick and chilled them prior to baking. This one's a keeper! Thank you for the fantastic recipe—super simple and no chilling = perfection! Do you put them in the oven on the lined parchment paper? Or just put them in the freezer that way and then remove the paper before baking? I've made this recipe many times but the last batch I made crackled on the top. I can't figure out what could have caused this. The only change I made was from bleached to Unbleached flour. love this recipe! Any ideas?? Hello! I was wondering if you could be more specific on the mixing method (not real familiar with mixing cookie dough). :) When creaming the cold butter and the sugar what speed (Kitchenaid) and for how long do you recommend? I don't want to overdo it so as not to warm the butter up too much if that's the purpose of starting with it cold. Also, what speed and how long for the eggs/extracts? I usually add the flour slowly on stir speed until combined. I did make a batch and had to add another half cup or so of flour because the dough was sticky after 3 cups. I was using White Lily AP bleached flour as that's all I had. Could that be the reason I needed more flour? My dough was never crumbly. Just came together as a ball even after the addition of the extra flour. Flavor is delicious! Thanks for your help! Just want to get the right mixing method down so as to get a nice texture. Just tried this recipe last night and wow, they are definately what you say they are. They are easy to make, roll, cut out and they don't even spread when cooking them. How awesome is this!! Will make my life so much easier soon as I have to make 300 of them. Thank you so much. I have had problems when using baking powder the cookies spread and loose shape. The pictures of the cookies look so delectable it makes me want to eat them, Bridget! Were you the one who took them or had someone else take it for you? Kudos either way! And your recipe is a bomb! I made this for my family recently and I love the fact that they are somewhat soft that it makes it easier for kids and oldies to eat. I also used different cookie shapes for this recipe. These are the best sugar cookies I have had. I never made sugar cookies before because anytime I ate one it tasted gross. 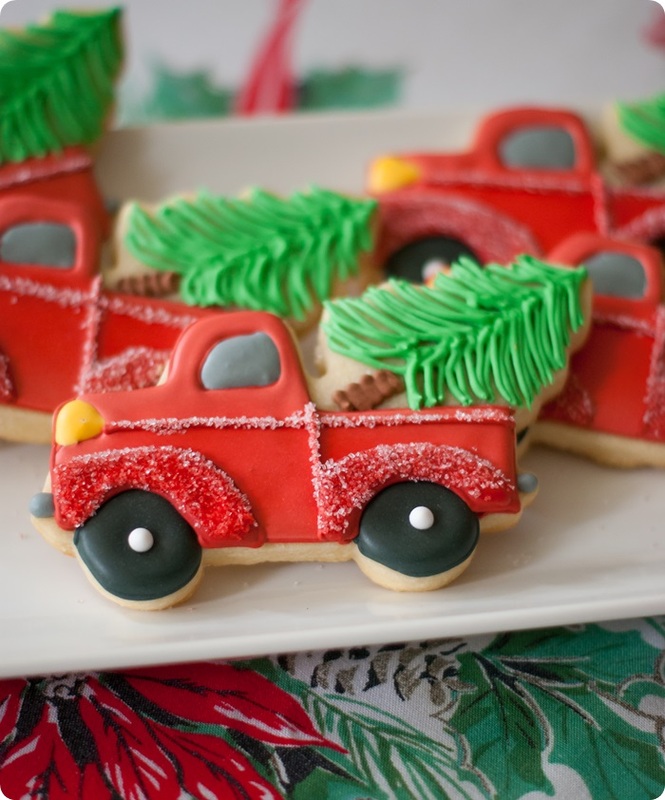 But I made this recipe at Christmas because my hubby loves this kind of cookies. So because I love him :-) I wanted to surprise him at Christmas with sugar cookies. Needless to say, they were a hit and I ate a bunch too. Can you substitute other flavors for the almond? Like banana? The bride loves banana. Hi, hoping to try this recipe this weekend. Any changes for elevations over 5200 feet? Appreciate the info. superb and beautiful content! Thanks for sharing us! My family and friends love the cookies. Been making these cookies for over 5 years and they are always the best. Making 60 cookies for my good friend's baby shower next week as a thank you treat for all the guests. Thank you so much for sharing your wonderful recipes and stories. Thank you for the good information that has come to share to everyone. Thank you very much for sharing your recipes and wonderful stories, and I love your blog very much. The cakes you make are delicious. Are you a baking expert? I am wondering if you can use cake flour for this recipe, or will the dough expand? Thanks! Thank you for this recipe! How long do you cream the butter and sugar for? What color/texture are we looking for? You'll want to eyeball it rather than time. The butter should be fully incorporated into the sugar (no lumps). It will be a light yellow color. Do you have the amount for the flour in metric? I don't. I always use cups for this recipe using the spoon and sweep method. I'm not sure. I'm so sorry! Can I use regular flour as opposed to unbleached?